Carte des Royaumes de Belgique et de Hollande. 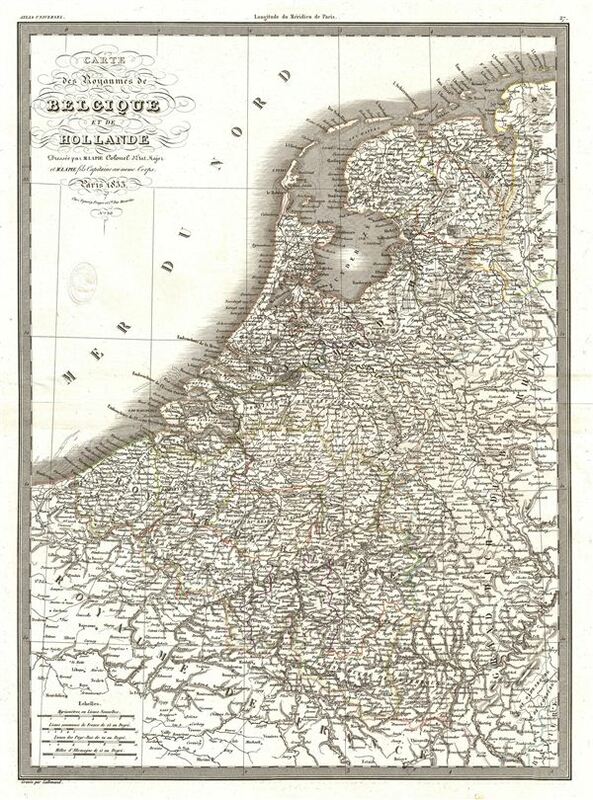 A fine first edition example of M. Lapie's 1833 map of the Kingdoms of Belgium and Holland. The map covers all of Belgium and Holland from the North Sea to the Kingdom of France. Just three years prior to the making of this map, the Belgian Revolution of 1830 led to the secession of Belgium from the United Kingdom of Netherlands into the independent Kingdom of Belgium. This map was engraved by Armand Joseph Lallemand as plate no. 27 in the first edition of M. Lapie's important Atlas Universel. This map, like all maps from the Atlas Universel features an embossed stamp from the Lapie firm. Rumsey 2174.027. Phillips (Atlases) 754, 765.